Every day is bringing us closer and closer to everyone’s favorite November holiday: Thanksgiving! There’s so much to look forward to, especially when it comes to the Thanksgiving day feast. The one thing you don’t want: digestion issues + runaway weight gain! 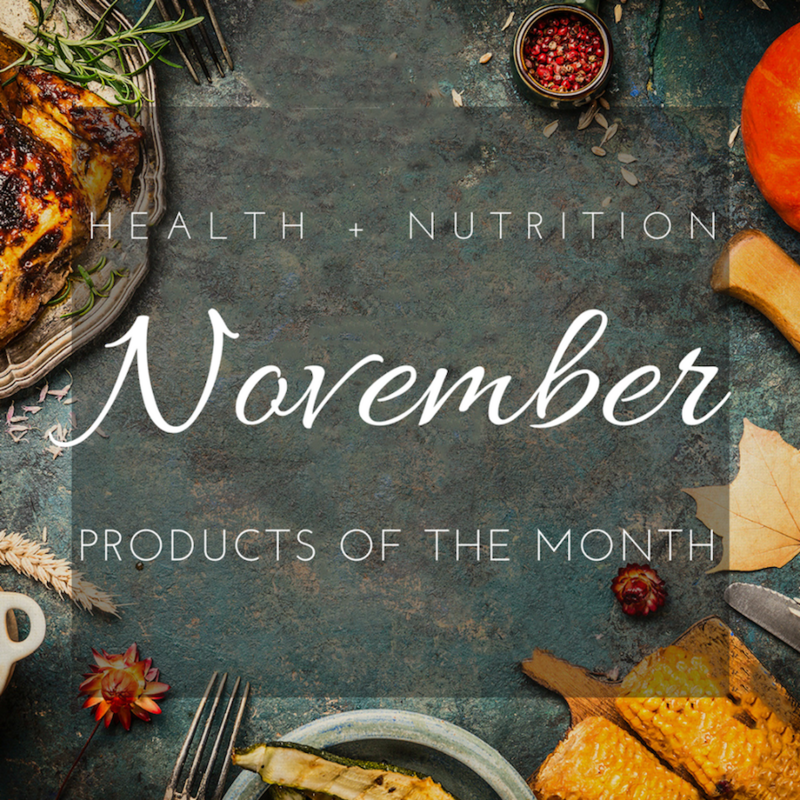 If you want to enjoy your Thanksgiving without worry, make sure you’ve got these November spotlight products on-hand! Probiotics, in case you haven’t heard of them, are beneficial bacteria that are essential for balancing the GI tract and promoting a healthy immune system. 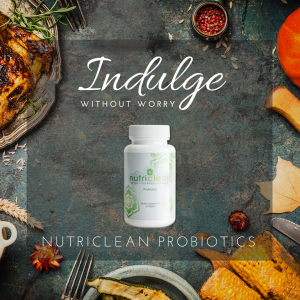 NutriClean Probiotics provides ten different strains and 10 billion active probiotic organisms. Each strain has a unique purpose, but work synergistically to promote numerous areas of health that range from immunity to stomach comfort and bowel regularity. By utilizing LiveBac® technology – a unique tableting process that delivers these organisms in a way that makes them far less susceptible to environmental factors – you can be sure that you are getting the most effective probiotic product to ensure healthy digestion! Plays a major role in immune support. This has been shown to promote bacterial balance to support digestive health and promote healthy teeth and fight off at least five dangerous bacteria that are involved in the formation of plaque on teeth and peptic ulcers. Has been shown to promote bowel regularity. Supports the protective barrier in the digestive tract to help maintain a healthy bacterial balance. Helps promote a healthy bacterial balance by competing for attachment sites in the intestines. 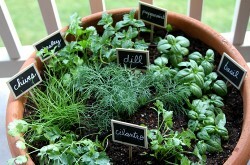 Included because research has been shown to promote overall health. Supports overall digestion and metabolism. Did you know that the average American gains 1-7 pounds during the six-week period between Thanksgiving and New Year’s Eve? Heading into the holidays with unhealthy habits is a recipe for adding excess weight, and heading into 2018 feeling sluggish and tired is not how we want to start the year! The TLS 21-Day Challenge Kit is a great way to either shed a few pounds or simply reset your eating + learn new, healthy habits! After all, it only takes 21 days to create a habit to set yourself up for New Year’s Resolution success! This colon and liver cleansing system uses exceptional herbs and botanicals to detoxify, cleanse, and purify the digestive tract and liver. With select nutrients and botanicals, the NutriClean 7-Day System mildly purges the body of potential or accumulated toxins using an innovative three-step process. This powerhouse of herbs, fibers, and extracts has helped many people support their colon health by helping to combat the effects of poor diet and environmental toxins. These provide a great nutritional alternative for active lifestyles. Available in chocolate and vanilla flavors, the TLS Nutrition Shakes deliver an optimal balance of protein, carbohydrates, and fats in every serving. In addition, it also provides over one-third the recommended daily allowance (RDA) of fiber and 22 different vitamins and minerals — all with just six grams of fat per serving! Isotonix OPC-3® is an isotonic-capable food supplement that is made from a combination of bilberry, grape seed, red wine and pine bark extracts, and citrus extract bioflavonoids, all found to be powerful antioxidants. Studies have shown OPCs to be up to 20 times more powerful than vitamin C and 50 times more powerful than vitamin E in neutralizing free radicals. Enjoy the holiday season with healthier habits + a healthy digestive system with the TLS® 21-Day Challenge Kit and NutriClean® Probiotics!